It has been an interesting journey so far. The 0-0 result against PSG I thought was going to set us up for another great run in the Champions Cup. After reaching the final in the previous season I was pretty convinced we’d flop comparatively this year. Chelsea humbled us in the second fixture of the tournament though. I tried the 5-2-3 formation, which held its own mostly but unfortunately one of our more experienced line-ups wasn’t up to scratch. 17-year old Carlos Silva lead the line for us but at such a young age I was asking far too much from him. The biggest defeat of my save so far came in the second PSG game. We got absolutely outclassed. I’m sure if you were smarter, more analytical or observant than I then you’d learn something interesting from the game – I learnt nothing. I have managed to learn a bit about Chelsea since the last match. I did a little bit of research. 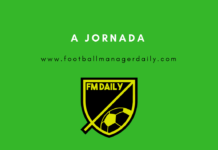 Leonardo Jardim is the manager, having previously spent five years at Monaco and a season at Sporting. His prefered formation is 442 which I know immediately rules out using my 4-2-3-1 formation. 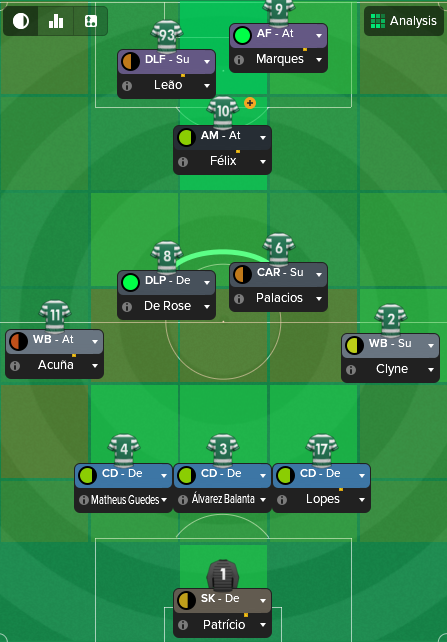 My 5-2-3 formation didn’t work last time either, and with my best winger, Daniel Podence, injured and my best strikers fit I knew I had to try something new. There are a few inherent issues with a 442 system. One issue is how the midfield sits. A midfield duo can easily be overrun by a trio. If the duo moves too much, the team loses all shape but if they don’t move enough then they become static and avoidable. The 2 attackers and 2 wingers are the main attacking threats. If you can mark them out of the game then they become almost helpless. They’ll need full back or midfield support to become useful again, but that will leave them open to counter attacks. How we nullified Chelsea’s attacking threat is clear to see in the image below. Our defensive zone is narrow and compact. I talked about that in my 4231 posts. We aim to get ourselves between the opposition and our goal at all times. It seems like common sense, but too many tactics fail at this. The centre backs can tightly mark the opposition forwards, meaning if they stick narrow they cannot function properly as targets for out-balls. Thanks to our three-man defence though we can still keep a spare man at all times. If they play shifts left or right, the defenders can just hand-off the striker to their partner. If it shifts wide and strikers go wide we can leave them. 3v1 in the box is rarely a threat. Our midfielders are free to push the appropriate men. The attacking midfielder drops deeper and can pick up a central midfielder, leaving one of mine free to go wide to support the wing backs. My strikers pick up the central defenders meaning there is no ball backwards to recycle play. Chelsea are left with a do-or-die scenario. They either attack or they lose the ball. This is shown adequately by a passing map. I’ve done the count, Chelsea had just 29 backward passes including their five kick-offs. Seven of these were back to the Thibaut Courtois, their goalkeeper. That leaves them with 17 backward passes in total. They simply had nowhere to go. Zero of these backward passes came from a central midfield position either. Another interesting stat is that between the two Chelsea central defenders, they only received 11 passes all game. Five of those came from kick-off meaning just 6 passes were received by either César Montes or Kurt Zouma. 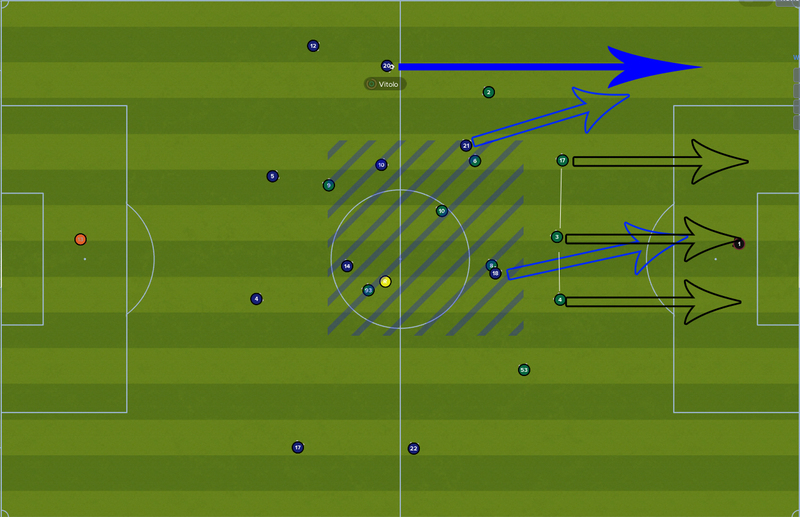 This lack of ability to recycle possession left Chelsea no option to play the ball forward into my defensive zone. For Zouma, this was pointless. Of his 48 attempted passes, he only completed 25, with 18 being intercepted. So in this first image, N’Golo Kanté has the ball central. The player positions are weighted to their left due to the play beginning from a throw-in. We’ve adjusted to this, with our free man being on their left (our right). Kante has only two passing options, both out wide. If he passes to the right side (to 17 or 22) there is the possibility my wingback will intercept. He is also more likely to misplace a long pass. If he plays it to the left side we have got a man advantage over them. 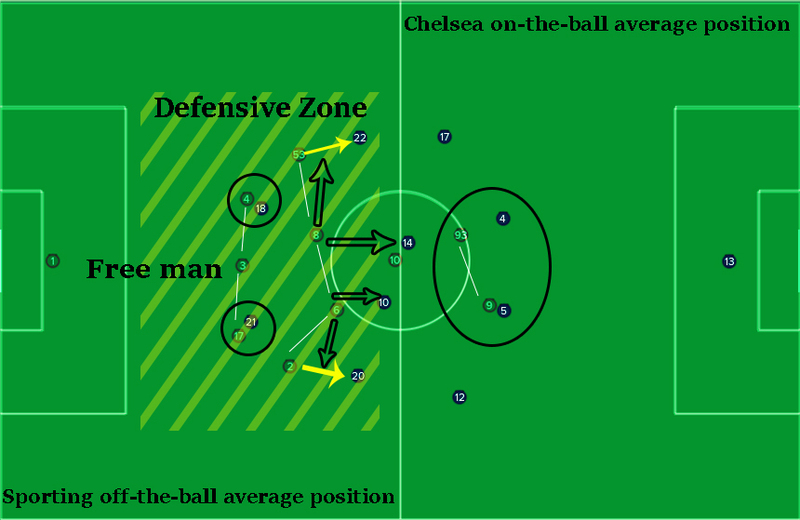 This next example is of a Chelsea counter-attack. Vitolo has plenty of room to run into but a lack of forward passing options as the midfield duo are so deep. On this occasion, like many others, the Chelsea 21 (left striker) makes a run between the wing-back and centre back. 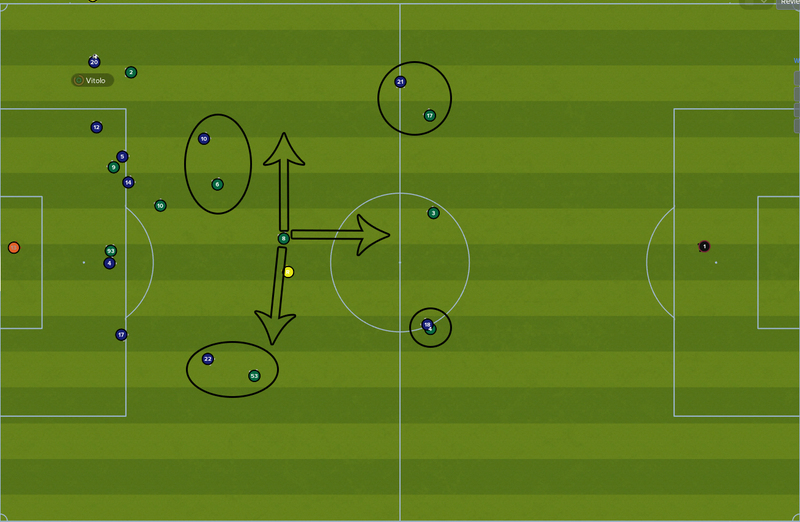 This, however, leaves them with one man in the box, as unless 21 can hold the ball up for a long time, everyone else in the Chelsea team has a long way to run to get into the penalty area. Again analysing a Chelsea offensive transition, we see Vitolo picking the ball up deep after the Sporting play breaks down. However, Vitolo only has two options for a pass, and both players are already becoming marked. 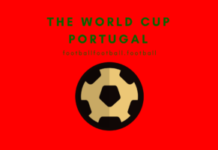 The Sporting set up allows number 8 to be flexible in his positioning and can support in a number of ways thanks to the lack of central opposition players. The balance of this tactic is what makes it successful. The three centre-backs allow us more creative freedom when choosing our other roles as we have an easy defensive structure already. Four at the back is fine in a lot of cases but limits your options. You’ll always be worrying about your fullbacks going missing. With three at the back, my fullbacks have cover from the left and right centre-backs. My midfield provides a strong base for the attacking players. A deep-lying playmaker wants the ball all the time and will move enough to go find it. On the flipside though, with a defensive duty, he comes with Hold Position meaning he won’t go wandering too far, rather expecting the ball to come to him. Similarly, the Carrilero will not stray too far. He isn’t needed to get into the box, we already have three players in there. He just ensures the ball is transition efficiently from defence to attack. In attack, the DLF, AF and AM were chosen for their preference to drift around when necessary rather than because they want too. The attacking midfielder makes himself a nuisance by pushing into the box when the time is right but also drops deeper to defend. The DLF pulls away from the central defender into the gap between midfield and defence. If he is followed then gaping holes in the opposition defence appears for the AM to exploit. If he isn’t followed, then he just has plenty of room to work in. The AF simply occupies a central defender. He will stay central until it is clear a pass will not come to him, at which point he changes to his secondary focus, which is to move into a channel and try to attract the ball there. The AF will also fulfil his defensive duties by aggressively chasing central defenders or the ball. His focus in a three-man attack is solely against one central defender, meaning he effectively man marks him. I’ve focused entirely on defence here because the attacking phase is simple. I was listening to someone talk about Pep Guardiola the other day, and decided to take his philosophy. I rely on the ability of my players to make the right decisions at the right times when we have the ball. There are no attacking instructions from me. I haven’t touched player instructions at all for my attacking trio because I don’t need to. They will score providing we get the ball to them in good positions. 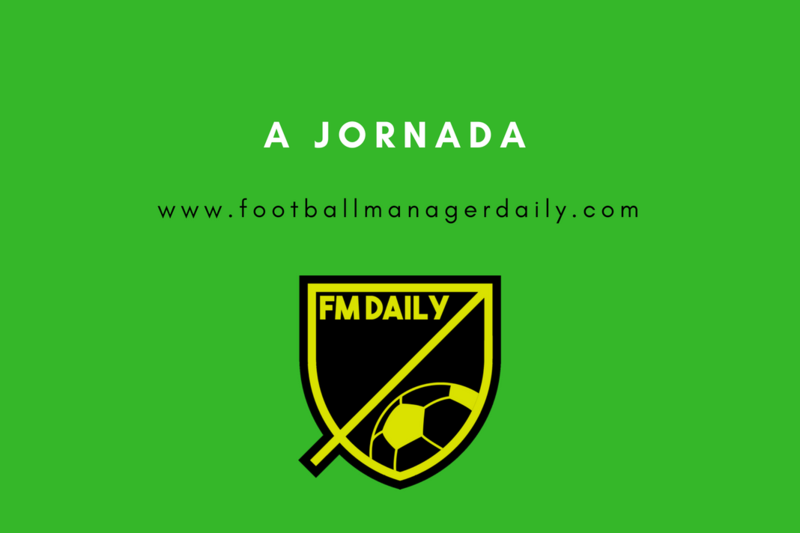 To do that we need to turn over play at opportune moments, and be ruthless in possession. My midfield duo to start the game are both incredible ballplayers with the vision to match. Up front, we have three players with great off-the-ball movement meaning I can rely on them to make the correct runs. It sounds simple, but I trust my players.